There have been numerous studies which draw a direct link between overweight or obese dogs and cats and their overweight owners. Put simply, overweight owners are more likely to have overweight pets. That’s not to say that there are owners who are not overweight, but who have overweight dogs and cats, because there certainly are. It’s just that there are a much smaller percentage of them than those who are overweight and who also have overweight pets. Sadly, according to a number of recent studies, more than 50% of the dogs in the United States are overweight. And all that extra weight on dogs causes the same health issues we see in overweight people – namely diabetes, heart disease, high blood pressure, respiratory issues, joint and ligament problems, digestive disorders, and overall decreased quality of life and shortened life span. What a lot of it boils down to is that people who don’t watch what they eat and who do not exercise, tend to apply the same approach to their dogs. Feeding them whatever, whenever or “treating” them with people food are not at all unusual in when it comes overweight dogs. This begs the question; With the life span of average dogs being about an all too short 10 years, wouldn’t you want to do all you can to not only increase their life span, but also their quality of life? And, if so, are you willing to make some possibly tough changes? If you and/or your dog is overweight, and you can honestly answer “yes” to both of these questions, congratulations. You may have just started a new, healthier chapter in not only your dog’s life, but quite possibly in your own life, as well. I speak from experience on all of this. I have had dogs nearly all of my adult life, have never been overweight, and, according to my doctor, am very healthy. I attribute this in very large part to the fact that I have always done all I can to keep the dogs who have blessed my life as healthy and as happy as possible. Therefore, I have never been one to give my dogs people food or an overabundance of either dog food or dog treats, and have always made sure my dogs got lots of exercise every single day. And, by exercise, I don’t mean a leisurely stroll around the neighborhood. I mean a 30-45 minute power walk, a hike or a run, at the very least, every day, all things which require me to physically engage in exercise, right alongside my dog. But, honestly, I’m a bit lazy, and, if not for my strong desire to always do what’s right by my dogs, I would probably not exercise at all. As it is, I get up at 5am every weekday, so I have ample time to either hike or run with my dog before I go to work. And, weekends, I am up at 6, because I know that the trail we hike will be very busy if we don’t get up there early. My desire to ensure my dog has an enjoyable and satisfying, yet healthy diet has also helps me make smarter choices when it comes to my own diet. This is because I found that when I got into the habit of carefully checking ingredients on any dog food or treat I am considering buying, I also got into the habit of doing the same thing for the things I purchase for myself to eat. 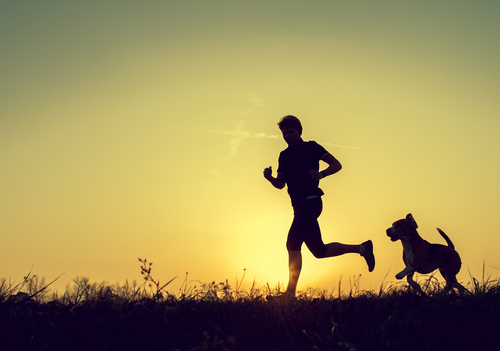 What this boils down to is that purely through my desire to do the best thing for my dog, I am very motivated to get out of bed and exercise every single day, and to watch what I eat. Or, as I prefer to look at it; I am very healthy thanks to my dogs. Can you say the same thing? If not, it is never too late to change. Use your desire to do what’s best for your dog or dogs to help dramatically improve their health and quality of life, as well as your own. If you make “I want to do everything I can to increase both the quality of my dog’s life and the length of his or her years” your mantra, and stick to it, you’ll very likely both be much healthier and happier in no time – and you’ll quite possibly increase both your dog’s lifespan and your own, in the process.